The class of duty making use of the ability of electric motors to operate with overload is called Periodic Intermittent Duty. The load on the motor is a sequence of identical duty cycles as shown in Fig. 5.17. The drive motor is loaded at constant load for a period ton. At the end of ton the machine is switched off for a period of toff. The machine heats during ton and cools during toff. The time toff is insufficient for the machine to cool to ambient temperature. Also one cycle comprising ton and toff is insufficient for the motor fluctuation. The machine attains thermal equilibrium after a number of load cycles. The mean temperature attains a steady value. The load diagram for this class of duty is shown in Fig. 5.16 and the ratio ton/(ton+toff) is called the duty factor. The effects of losses during starting on heating, are neglected. Such a class of duty may be identified when the losses during starting affect the motor heating and have to be considered. 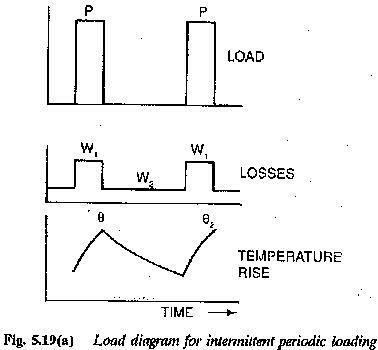 The load diagram for this Periodic Intermittent Duty is shown in Fig. 5.17. 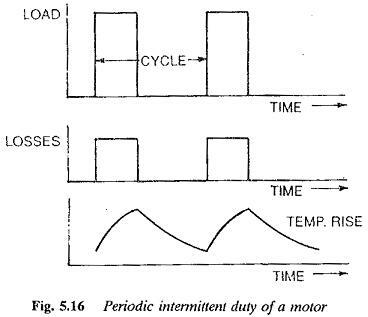 The Periodic Intermittent Duty includes starting period, period of constant load and rest period. The duty factor is given by (tst+ton)/(tst+ton+toff).. In this duty the motor stops during toff by natural means and stopping does not include any additional losses. This takes place if toff is sufficiently greater than the time required for stopping. When the machine has special methods of braking, the losses during braking must also be considered in the choice of motor rating. This is another sub class of duty. 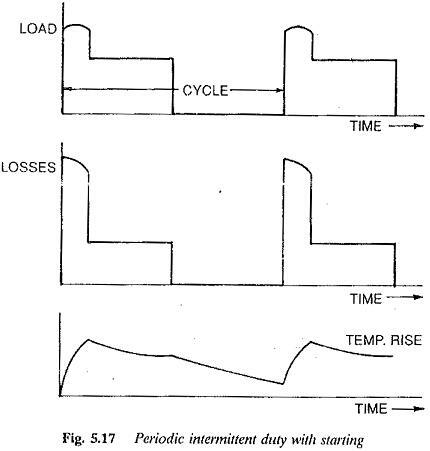 The Periodic Intermittent Duty contains a braking period besides a starting period, period of constant load and rest period as shown in Fig. 5.18. The duty factor (tst + ton + tbr + toff). Let us consider the selection of a motor for duty factor having ton and toff (no starting and braking). The starting losses do not influence the heating. The load cycle and heating curve are as shown in Fig. 5.18. Here again a motor of rating equal to the constant load in the load cycle would prove uneconomical because it would have excess heating capacity. 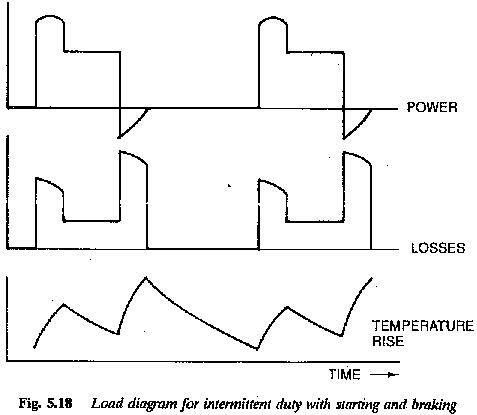 A motor of smaller capacity would be sufficient due to rest periods in between successive loadings, during which the machine has an opportunity to cool. A ratio (P/Pr) can be estimated for this class of duty also. The mechanical overload ratio can be determined assuming the loss ratio r=Wc/Wv. From this relation the rating Pr of the motor to drive the load can be de­termined. For duty ratio > 0.6 the expression shows that a motor having a continuous rating of P may be selected. 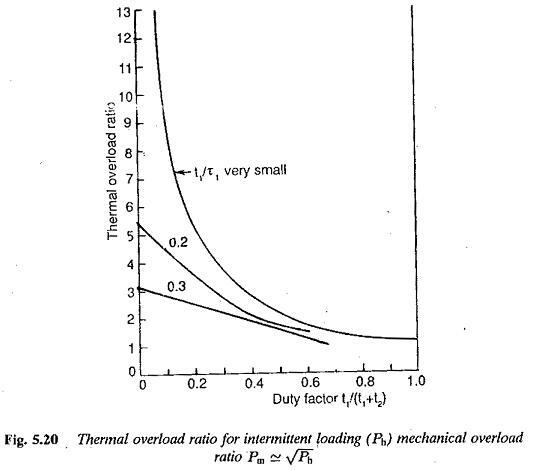 (P/Pr) tends to unity for load ratios: > 0.6 assuming the same heating and cooling time constants. The motor size becomes smaller only for small duty ratios. Also the `on’ period should be very small compared to the time constant to get the benefit of a smaller motor. For classes of duty where starting and braking periods are there, the motor selection should take these into consideration. The motor selected must be checked for its overload capacity. If the duty factor is very small, this may pose a problem and a motor of higher capacity may be chosen. For larger duty ratios the value P/Pr will be such that the machine does have overload capacity to drive the given load cycle.